Bollywood's singing legends - sisters Lata Mangeshkar and Asha Bhosle - shared a stage after a long time when Asha presented Lata-didi with the lifetime achievement award at the Chevrolet Global Indian Music Awards (GIMA). Asha, along with music maestro A.R Rahman, late Wednesday presented the award to the 81-year-old singer, who is a Bharat Ratna awardee. "She is so big that you are always at a loss of words in front of her. I feel happy in presenting this award to her," Asha said at the event here. Added Rahman: "If my father would have been alive today, he would have really felt nice. My mother used to tell me that my father had a picture of Lataji in a white sari." "After getting up in the morning, he used to look at that and compose songs. I'm so happy that I got the opportunity of presenting this award to her," he added. But, the two sisters who are known for their distinct singing styles and their not-so-stable relations, didn't budge from taking potshots at each other on stage. Asha, who had performed at the beginning of the event, stated that she felt upset that Lata didn't see her performance. "I performed in the beginning of the event, but didi (elder sister) had not come till then. She never listens to my songs. I feel upset about that," the 77-year-old singer complained. Lata was also not far behind. She made her own complaints in an amusing manner. "Asha, my sister, has given me this award. She is four years younger to me. 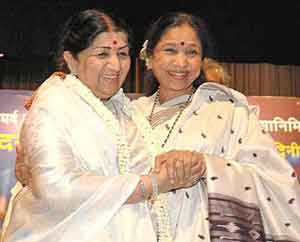 She has always only fought with me and troubled me but I always forgive her," Lata said laughingly. Lata talked about her happiness on getting the award, and said there should be no full stops for an artiste. "I'm very happy on getting this award. An artiste should not put a full stop to his art after getting a lifetime achievement award. The achievement should continue always. Should not ever say that it's over and this is the end. I believe in that," the veteran singer said. The award presentation was preceded by a special performance by music composers like Shankar Mahadevan, Loy Mendosa, Uttam Singh, Raju Singh, Salim and Sulaiman Merchant and Shantanu Moitra. The performance was a tribute to Lata.